Archer Daniels Midland (ADM) is one of the world’s leading agricultural processors. As the world’s population grows, so does demand for quality foods, feed ingredients for livestock, alternative fuels, and environmentally friendly alternatives to traditional chemicals. ADM plays a pivotal role in meeting all of these needs. For more than a century, the people of ADM have transformed crops into products that serve the vital needs of a growing world. Today, it is one of the world’s largest agricultural processors and food ingredient providers, with more than 32,300 employees serving customers in more than 160 countries. With a global value chain that includes 428 crop procurement locations, 280 ingredient manufacturing facilities, 39 innovation centres and an outstanding crop transportation network, ADM connects the harvest to the home, making products for food, animal feed, industrial and energy uses. Because of its pre-eminent position,ADM is able to serve thousands of customers efficiently and profitably. Its customers benefit from ADM’s wide global reach, strong relationships with farmers, and extraordinary range of logistical, analytical and technological services. One of the regions in which ADM is particularly active is the US Gulf. Archer Daniels Midland Company’s (ADM) Ag Services business unit has two major groups operating in the Gulf. ADM Grain Company, the export grain division of ADM, has four grain elevators and two floating rigs that can either load at a buoy system or alongside a vessel at an elevator. These floating rigs have scales for actual weighed cargo. American River Transportation Company, LLC (ARTCO), the river transportation division of ADM, also has six midstream floating rigs currently in operation. To support both of these operations in the Gulf region, ADM, through its ARTCO division, currently operates 20 fleeting boats, a full-service shipyard with five drydocks, and a full-service barge wash and repair facility. The US Gulf is a very important region for ADM. The company buys a variety of products from local farmers, including wheat, soybeans, corn, milo and other crops. In terms of customers based in the US Gulf, ADM has some local farmers on the export side, and many of its northbound customers have a significant presence in the US Gulf. As ADM has customers in more than 140 different countries, it relies heavily on the US Gulf region as one of its most important hubs for exports and imports. The US Gulf helps provide access to ADM’s vast transportation network throughout the world. The US Gulf is an important region for ADM, so it is always looking for opportunities to potentially grow its business. For example, it completed the missing link in its self-contained supply chain in 2015, with the launch of ARTCO Stevedoring. ADM has solid partnerships with all of the ports in which it operates, namely Port of South Louisiana and Port of New Orleans. In terms of tonnages handled, in 2014, ADM exported 988 million bushels of grain/product from the US Gulf. ADM Logistics offers full turn-key service to its customers including ocean-going vessels, containers, ship agency, stevedoring, barges, linehaul vessels, rail car, terminals and trucking. It’s truly a one- stop shop for transportation customers. ADM uses a Heyl Patterson Marine Leg at its elevators. ARTCO Stevedoring has a fleet of six Gottwald-Terex cranes, with capacities up to 100 tonnes/lift and production up to 10k to 15k tonnes/day/crane. ADM has its own storage at each of the four elevator locations. In total, it has in excess of 16 million bushels of storage in both silos and shipping bins. To protect the environment and operators, ADM also has dust systems in place on everything that it unloads and loads out. Safety is the top priority at ADM. In addition to a best-in- class safety programme and culture instilled in each and every employee, ADM practises excellent housekeeping and focuses on training for its employees. Its fire-prevention measure include: smoke and carbon monoxide detectors, sprinkler systems, fire pumps, fire hydrants, explosion suppression systems, hazard monitoring systems, among others. ADM owns and charters vessels ranging from small Handymax vessels to Post-Panamax vessels. It currently owns ten ocean-going vessels and charters many others. 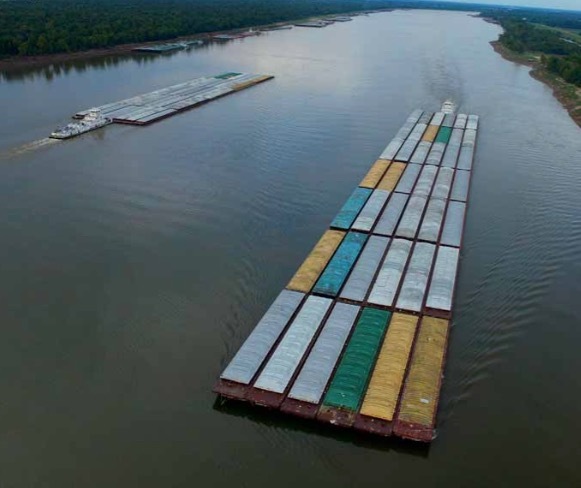 ADM currently operates one of the largest covered hopper fleet in North America, operating primarily in the Upper and Lower Mississippi River, Ohio, Arkansas, Missouri,Tennessee and Illinois River regions, as well as throughout secondary river transportation corridors like the Red River and related waterways. In the US Gulf, ADM’s primary source of unloading grain is via barges. It also uses rail and at times, unloads trucks at its St. Elmo facility. ADM has one of the largest transportation networks in the world, so it has a range of options to offer its transportation customers and also to move its products and supplies. fleet of lineboats, fleet boats, and barges, it operates 17 fleets throughout the inland river system, a fuelling terminal, line handling and crewboat services, barge washing and repair facilities, and full-service shipyards. ADM is one of the only companies that can offer full vertical integration of the entire supply chain without the use of a single third-party, which is a tremendous competitive advantage for ADM and helps it provide efficient, seamless service to its customers.